OSWEGO – “We are saddened by the loss of two of the three kittens today,” said Joe Stabb, Executive Director of the OHS. Due to the complications of birth and their inability to feed properly, two of the kittens have unfortunately died, he said. Only the black and white one has survived. “We are told by the veterinarian that his can happen. The third kitten has been reunited with the mother cat,” he said. The kitten will also be bottle-fed to be sure that it is receiving enough nutrients for healthy growth. The Oswego County Humane Society is asking for the community’s help with the care of the felines. 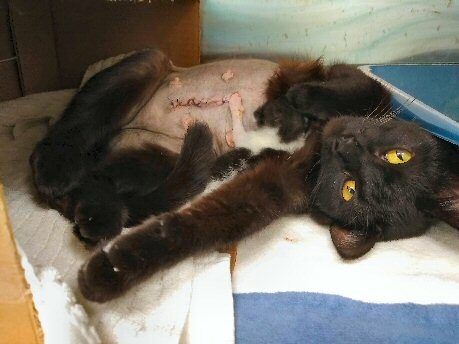 The veterinary costs and care of the mother cat and her kitten is more than $2,000. Any donations to help would be greatly appreciated and can be made online at www.oswegohumane.org or by calling 315-207-1070. If you are unable to care for your animals and need assistance with getting a new home for your pet, there are resources available. “We can assist people with finding a safe home for your pets,” Stabb said.